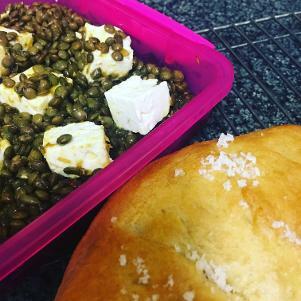 I make this for lunches almost every week, our accompaniments are usually feta cheese, spiced chicken or crab with a side salad...and sometimes a little bread. It keeps well in the fridge for a few days so I only ever make one big batch. Puy lentils tend to have a lengthy cooking time - I cook mine in a cheap pressure cooker (£15) with 1 litre of water and a splash of oil on a high heat until the pressure is reached. I then turn down the heat to low, cook for a further 7 minutes, turn off the heat and leave until the pressure drops. Drain and cool the lentils, then throughly coat with the dressing.